Remember the days of students sitting in grid-like classroom rows with a teacher sitting behind a desk glued to a laptop screen? Those days are going, going, soon to be gone, said Jason Meyer, senior product manager, Epson America. So what’s next? With the InFocus JTouch, fifth grade teacher Kelli Joy at Marysville School is able to get her students more engaged in presentations, lessons, activities, and even teaching. When the term “active learning” was coined in the mid-1990s, it was to drive more advanced critical thinking through enhanced engagement, noted Michael DiBella, director of product marketing, Kramer. 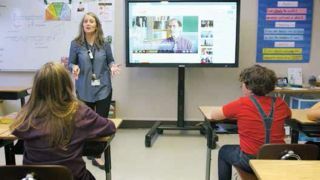 When primitive digital whiteboards first entered the education space, they were used primarily to display content from the web, offering little opportunity for interaction with students, added Pippa Edelen, director of worldwide PR and social media, InFocus. Active learning is an approach, a pedagogy, and not, first and foremost, a type of room or a type of technology, noted Gina Sansivero, director of business development, education, FSR. Beaver Acres Elementary School teacher Heather Hoxie uses a combination of one-to-one devices paired with an interactive InFocus JTouch display to individualize and accelerate instruction to her fourth grade class. For AV, IT, and infrastructure support professionals, there are some fundamental technology considerations when designing a distance learning program, Sansivero said. These include a school’s overall definition of and requirements for e-learning and how students will retrieve independent study materials from the school site and submit projects via email. Figuring out how to integrate collaboration, wireless connectivity, and IoT into a classroom, and making sure everyone uses the technology is key. “Rooms need to support how students communicate with each other for teachers to be able to blend those behaviors into their curriculum,” said Kramer’s Michael DiBella. The Matrox Monarch LCS is a stand-alone system that integrates with video management systems such as Opencast and Kaltura, as well as learning management systems like Moodle. RTMP or RTSP protocols are used for live streaming over local media servers or CDNs; when recording, MP4 or MOV files are directly written to network-mapped drives. A recent firmware update includes functionality such automated scheduling, whereby the Monarch LCS can be configured to start automatically before a lecture; as well as the ability to record files locally to an SD card or USB drive to reduce network traffic during peak hours. Based on the company’s Mediasite Video Platform, Sonic Foundry’s Mediasite Join integrates with conferencing systems by Cisco, Lifesize, Zoom, Polycom, Vidyo, and Sony. It’s available in the cloud as well as on premise; the former publishes recorded video calls to Mediasite Video Cloud while the latter publishes to Mediasite Video Platform. Mediasite Catch, slated for release in the summer of 2017, is scalable video capture software built for classrooms that aren’t outfitted with any (or not many) AV capabilities. Designed for USB/IP-based applications, this solution enables the mixing of audio and video of multiple sources directly to a PC in the interest of simplifying AV control and cabling in multi-camera and multi-audio source environments. The system is comprised of an AV encoder with simultaneous IP and USB 2.0 streaming; a four-input seamless HD video switcher; three Quick-Connect interfaces for Vaddio cameras, an 8X4 cross-point audio matrix mixer/switcher (featuring acoustic echo cancellation); and four Vaddio EasyUSB microphone ports (also featuring AEC). Programming, control, and management is done through a web server. Panasonic’s UE70 is a 4K pan/tilt/zoom camera (3840 x 2160 at 29.97p/25p via HDMI). The camera will stream in 4K over IP as well as record it, and features direct-from-camera AV streaming up to 2160/30p. For those who want to minimize cable usage, the UE70 can be used as a single cable solution, thanks to its IP control, audio input, and PoE+ Power over LAN cable. PC-based videoconferencing is also possible with its USB Video support. Compatible with most lecture capture software, this camera delivers up to 3840 x 2160p resolution transmitted across HDMI or HDBaseT. It will support command protocols such as RS232/RS322, and is suitable for live 4K streaming as well as recording. As a result of its partnership with Dycap Media Solutions, Marshall’s PTZ cameras make use of Perfect Track software, which intelligently tracks presenters without the need for additional equipment or operators. 1 Beyond Inc is now shipping its 1 Beyond Collaborate AVS, an innovative video conferencing solution. Collaborate AVS offers an enhanced conference or meeting experience by automatically focusing the camera on the active speaker. Ideal for larger meeting rooms, classrooms, courtrooms and panel discussions, Collaborate AVS gives a close-up view of the person talking and can be used for video conferencing as well as recording, streaming, or IMAG (Image Magnification). No camera operator is required as switching is automatic. Up to eight cameras and 250 microphones can be placed anywhere, even accommodating rooms where the presenter and audience face different directions. The system is easily configured with a browser-based interface. Collaborate AVS supports the newest push-to-talk or voice-activated table-top mics or ceiling arrays, including Shure Microflex Advance, Shure DDS 5900, Shure DCS 6000 and 1 Beyond AVS Wireless Microphone systems. In addition to standard codecs from Polycom and Cisco, Collaborate AVS works with software conferencing solutions like Skype, Zoom, BlueJeans and GoToMeeting. The software can run on the Collaborate AVS system so a separate computer is not needed. Revolabs, a wholly owned subsidiary of Yamaha Corporation, is offering its Executive Elite 2-Channel wireless microphone system. The wireless rackmount microphone system is well suited for auditoriums and lecture halls. It can also be part of a lecture capture system, providing intelligible sound of a speaker’s voice in remote learning applications. Simple connectivity, remote monitoring and diagnostics, and straightforward network management alongside other network devices make it an ideal solution for in-house AV and IT teams. Revolabs also works with a diverse array of technology partners, including Google, Yamaha, Sonic Foundry, Zoom, and BlueJeans. The TalkingPoints user interface by RUSHWORKS integrates PTZ camera control, file-based recording, text overlays, as well as three picture-in-picture windows (one for the PowerPoint/ Keynote presentation, one for the presenter, and one for panelists). The system can be used with RUSHWORKS’ Locked On video tracking technology, which follows the presenter automatically. Users may control TalkingPoints via desktop computer, laptop, or tablet, and up to three PTZ cameras can be controlled wirelessly via tablet. Presenter information (such as names and titles) is imported into Layouts prior to the beginning of a lecture. The system will accommodate live streaming as well as recording, and is included with RUSHWORKS VDESK and REMO Integrated PTZ Production Systems.